Buy yourself a piece of hockey history. 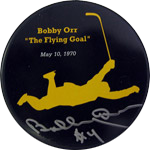 This Boston Bruin puck is hand signed by Bobby Orr. To help Bobby's fans celebrate the 40th anniversary of his Stanley Cup winning goal in 1970, we have created a puck with Bobby's image flying through the air. The official 40th anniversary puck framed with the famous photo of Bobby Stanley Cup winning goal in 1970. Purchase this unique stick holder (24" x 36") hi-lighting Bobby's illustrious career. Surrounding the etching of the old Boston Garden are 3 action shots including Bobby's famous goal. Stick not included.